It had to come to this…. I’m sorry. I had to intervene. I had to infiltrate. It had to come to this…. First off, many don’t know me any more than the illusive “admin” of Riddlethos.com. 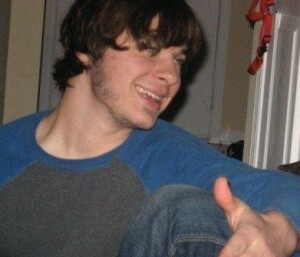 Beyond that, I’m known as Charlie Weingartner — Riddles’ (Oliver Motok) roommate. Until this point, I’ve not played much more than a behind-the-scenes role on this website. But for every man, there comes a point in life where you cannot further stand down. You MUST stand for your convictions, and make them heard. Today, Tuesday May 4th, 2010, I’ve reached that point. Call in the feds (or Mounties if you’re from the land above)! As proclaimed by dear and close friend Lusipurr’s cry “Kill him,” something had to be done. Riddles’ shameless “Awesome One-Liners Week” banner has sadly, in truth, ended his life. Culminating at, and cultivating his death sentence by creating such an atrocious attempt at graphic design, with aide of CS5 Photoshop (provided by yours truly), his life had to come to an end. 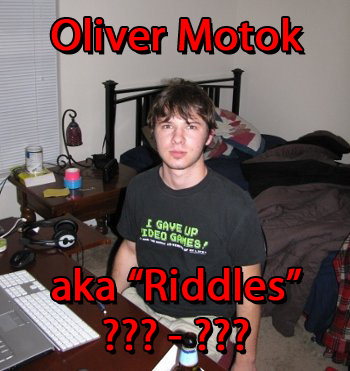 Oliver Motok, ??? - ??? I cannot, and further more — for my protection — will not go into any more details of our tragic friends death. But, I will assure you that this is NOT some measly April Fools prank. Riddles attempted at such hilarity around that time of year by “virtually-offing” our beloved Ethos, but it was merely a vain attempt at a poor, and an embarrassing form of comedy. But the proclamation must be made. I’ve destroyed Riddles; incinerated him to an unrecognizable point so his soul can never do harm again. Graphically, or otherwise. We shall dearly miss him, but hopefully his life insurance will be enough to cover this month’s rent. Riddles, we love you… but enough was enough. As always, I love you endlessly for leaving me behind your PS3, PS2, XBox 360, Wii, 42″ HDTV, and minimal Blu-Ray collection. The rest was burned with your lifeless corpse. May there be beer wherever you are now.